Matt FW Curran was born in Essex in 1974. From an early age he was brought up on a diet of fantasy and science fiction by parents who might have known better, but loved to encourage their son’s imagination. At the age of 11, Matt had already written his first book (The Vent) and by the time he was 17, he had written over a dozen short stories, writing his first novel The Forever Chain by the time he was 18. After studying in Sheffield, he made his home there, met his wife and continued writing books in his spare time. His day jobs have included working for a geographical magazine, a high-street bank, the Government, as well as moonlighting as a freelance journalist for a local music paper. Learn more at M.F.W. Curran’s website. The Secret War — (2007-2009) Publisher: For thousands of years a secret war has been fought between Heaven and Hell. Daemons and angels, vampires and knights clash for the future of mankind, and as the two sides wage war across the world, innocent people are caught up in the conflict — men like Captain William Saxon and Lieutenant Kieran Harte, two great friends who have recently survived the horrors of the Battle of Waterloo. But now they face a greater struggle, against the daemonic forces of Count Ordrane, and the clandestine ambitions of the Vatican. They must try to survive assassination attempts, political machinations, epic battles on land and sea, and above all the power of a mysterious bronze pyramid — the Scarimadean — that brings everlasting damnation to all who come into contact with it. Their only allies are an old man, a fading secret organization in the Church, and an enigmatic warrior, who may hold the key not only to the friends’ fates, but to the fate of all mankind. 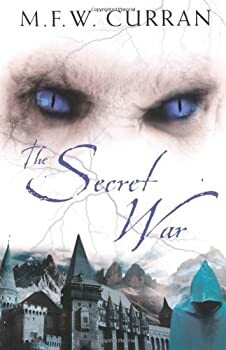 The Secret War by M.F.W. Curran is a combination of historical fiction and urban fantasy set at the end of the Napoleonic wars. The background of the book draws heavily on real places and political events from that era and I really enjoyed the sense of realism that these elements lend to the story. William Saxon and his all-but-adopted-brother Kieran Harte are thrust into the world of supernatural conflict when they are attacked by a monster shortly after the battle of Waterloo. After doing their best to destroy this monster, their lives are drawn inevitably into the ongoing conflict between good and evil. Their families and lives are threatened and their only way out is to embark on a journey into the heart of a secret militant Order that fights evil on behalf of the Roman Catholic Church.